The Nation learnt that the officers were chasing a ‘Yahoo yahoo’ guy who ran through Ogunmokun/Toll gate areas on motorcycle and heading towards Onipanu. 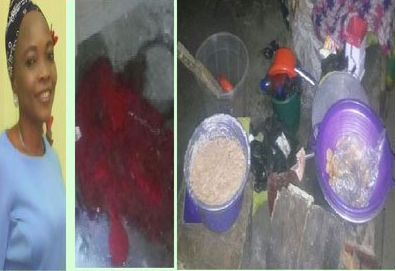 Policemen were said to have shot at him when it was impossible for them to nab him, but the bullet hit a woman selling yam cake (Ojojo) around Toll gate area. Angered by the officers’ action, the boys mobilised themselves and headed to the Olosan Police Station. Eyewitnesses said they were chased away with gun shots. About five of them were said to have sustained injuries. Another eyewitness, who simply identified himself as Segun said the officers took the body of the slain woman away. “I don’t know where they (officers) took the body of the woman to. But they headed toward their station,” he said. According to him, the whole of Ogunmokun, Post Office Road, Toll gate, Onipanu, Abiodun Junction and Kumuyi areas are no go area as traders hurriedly lock their shops and residents went indoor. An Armoured Personnel Carrier (APC) has been stationed on the Post Office Road as officers moving round the areas. The deceased’s elder sister Nimota Adebayo told The Nation last night that her sister’s remains have been deposited at Isolo General Hospital mortuary.